Blessed Sacrament Catholic Church was built on National Park Drive in 1948 and officially dedicated on February 12, 1949. 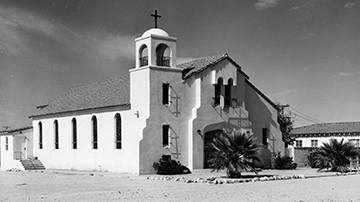 The mission-style church, with its bell tower and red-tiled roof, and the matching rectory, were built by the community residents of Twentynine Palms. 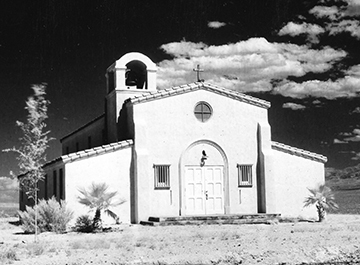 A fund-raising campaign was aided by Harry G. Johansing of 29 Palms Inn, who also donated the land, and, according to then resident priest Father Doud, “Three Wise Men”—prominent citizens Robert Van Lahr, Edward Kenney, and Robert Lear. Walter Berg was the contractor, and Claude Powell of Palm Springs was the architect. 74462 National Park Drive. William J. “Bill” Underhill published the area’s first weekly newspaper in 1935, called The Desert Trail, named for the long dirt highway he had traversed many times since homesteading in Twentynine Palms in 1928. A World War I veteran, he learned the trade with on-the-job training at several newspapers, including Pasadena Star News. 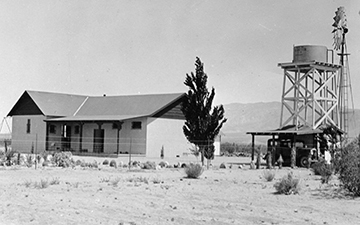 The first Desert Trail newspaper building in Twentynine Palms was built at 5770 Adobe Road in 1937. Designed and constructed by Allen Balch with local material and labor, it was the first business building in the new Adobe Acres subdivision. Underhill moved the business from his homestead to the building and installed a newly acquired linotype machine. With no electricity available, he used a kerosene-powered generator and later a single-cylinder diesel engine. In 1938 power lines from Leonard Wikoff’s plant at Four Corners finally reached the area. 5770 Adobe Road. Twentynine Palms’ original one-room schoolhouse was built in 1927 by volunteers for $300 in materials. Located on five acres of land donated by Bill & Elizabeth Campbell, the building measured 20 x 28 feet. A second room was added in 1931 to accommodate more students and to be used as a community hall for Saturday night dances and Sunday church groups. The shaded front porch was used at lunch hour and as a stage for graduation exercises. The schoolhouse was given to Twentynine Palms Historical Society for one dollar in 1991 by the Morongo Unified School District. The community raised approximately $100,000 for moving and refurbishing the building. The journey of two miles down Utah Trail took place on April 4, 1992, led by a Marine Corps Honor Guard, the high school marching band, parents, kids, dogs, and well wishers, and was filmed by Huell Howser for his KCET-TV series, California’s Gold. The remodeled building became the “Old Schoolhouse Museum” and historical society office. It sits on a four-acre parcel across the street from 29 Palms Inn and the Oasis of Mara at 6760 National Park Drive. In 1936, Western novelist Tom J. Hopkins hired the local adobe builders, the Stubbs brothers, to build him an adobe home just east of the 29 Palms Inn. The adobe was the second house built in the Twentynine Palms Corporation subdivision at the Oasis of Mara. Historic materials used in its construction included clay and tailings from the old Anaconda gold mine (now part of Joshua Tree National Park); adobe from Mesquite Dry Lake (now part of the Marine Corps base); and door jambs and window frames made with railroad ties from the old Los Angeles-Metropolitan Water District small-gauge railway in Owens Valley. In the 1950s, Mr. and Mrs. Sam Stocking bought the property from Hopkins; they later offered the adobe to the Twentynine Palms Artists’ Guild in 1963. It was purchased by boardmembers Ed and Margaret Schiller, who in turn leased then sold it to the guild for a permanent gallery. After a few months of remodeling, it opened with its first show in October 1963. 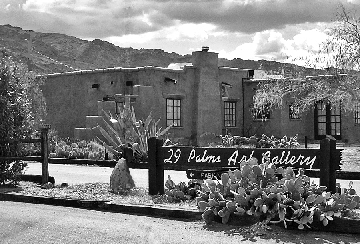 The historic adobe remains the home of 29 Palms Art Gallery and Gift Shop. 74055 Cottonwood Drive at National Park Drive. 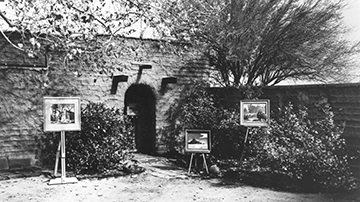 The Charlton adobe served as the Twentynine Palms Artists’ Guild’s gallery from 1956 to 1963. Designed by landscape architect Gerald W. Charlton and built in 1933-34 by local adobe builders, the Stubbs brothers, it was the first house in the early Twentynine Palms Corporation subdivision at the Oasis of Mara. In 1967 widower Charlton married widow Irene Zimmers, a noted watercolor artist, who lived in the adobe until her death in 1997. 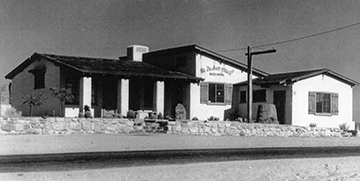 The adobe was then acquired by Jane Smith and incorporated into the 29 Palms Inn, and it was named “Irene’s Adobe.” Cottonwood Drive at Inn Avenue. In 2009, local historian and author Pat Rimmington published the second edition of her popular book, The Adobes of Twentynine Palms, an updated version of the original history book that was first published in 1988. The book features photos and stories highlighting nearly 100 classic adobe and adobe-mix homes and buildings constructed in the city from 1929 to the 1940s. The book is available for purchase at the Old Schoolhouse Museum and at Office Supplies Plus in Twentynine Palms.